Bayport, situated on the Great South Bay, was the south easterly part of the William Nicoll Grant of 1697. The east line was Namkee Creek, which separated the Nicoll Grant from the Brookhaven Grant. The west line is Brown's River and the San Souci Lakes. It was not until 1791 that the first sales from the Nicoll Grant were made, when a commission appointed by the state sold parcels to pay off the Nicoll debts. There seem to have been a few homes in the area but they must have been renters or squatters. The land was sold in long strips about 500 feet wide and extending for about one mile from the Great South Bay to the South Country Road (now Montauk Highway). Farmhouses were built more or less in a row through the middle of the farms. A large number of these farmhouses still stand today dating back from 1800 to 1860. 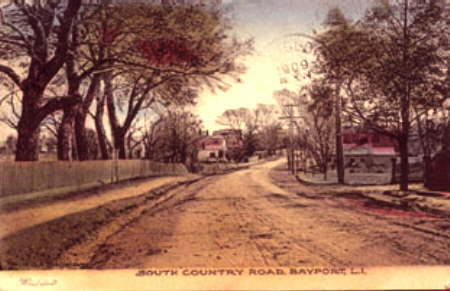 In 1834 a road was built through the middle of the farms from Sayville to Blue Point connecting the farmhouses, and was called Middle Road. In fact, the community was called Middle Road Village for a while, then became called Southport. It turned out that there was another village upstate called Southport, so when the Post Office was set up in 1858, the name was changed to Bayport. The present Post Office was built in 1956. 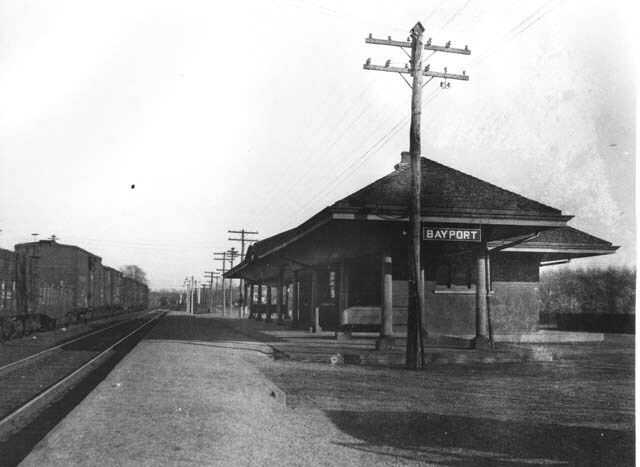 The railroad came to Bayport in 1869 and a man named William B. Arthur moved a house from Blue Point Avenue to the east side of Bayport Avenue, across from the Railroad Station, and he became Post Master and Station Agent. The house stands today in the same location. The original station was the building that is now The Bayport House Restaurante. In 1904 a new station was erected at Snedecor Avenue, but this station was torn down in 1963 and not replaced. The first store on Main Street (Middle Road) was opened by Warren Hawkins in 1860. It was bought by Isaac Snedecor in 1867, a retired sea-captain. It was later operated by Isaac Snedecor and Sons, then by Antos Brothers, then by Mr. Prall, then by Arthur Shand. Today the store is called Little Albert's, but many people still call it Shands because of Arthur Shand and his family's ownership of the store for almost 60 years. The first schoolhouse was a small one room building which stood on the north side of Main Street, where the old firehouse was later erected. The date was about 1810. In 1814, at the close of the War of 1812, a young naval officer named Lieutenant Burrill, jumped overboard from one of the British frigates that had been stationed in Garners Bay, and swam ashore. He started making his way to New York City. Halfway there he came upon the village of Bayport and found that they were looking for a school teacher. He became the first schoolteacher in Bayport and remained for thirty years. The first school house burned down in 1825 and another was built on the east corner of Main Street and Bayport Avenue, where Mantha's garage was later located. In 1870 a larger two story school was built on Middle Road at what is now Connetquot Avenue. In 1893 a fourth school was erected on the east side of Snedecor Avenue. It was a large modern school. This school burned on February 3, 1926. School was temporarily held in the large White House on the bay, until the new brick school could be built on Snedecor Avenue. In 1952 the Bayport and Blue Point school districts were consolidated. There is now a Senior High School, a Middle School, and three elementary schools in the district. The Bayport Fire Department was organized August 15, 1891 with 18 members. Charles R. Post was made Chief. A plot of land on the north side of Middle Road, next to Shands (Little Albert's) was purchased from I. S. Snedecor for $500 and a Fire House built for $3000. There was a belfry but this was removed in 1941. This building was sold to Shand and a new Fire House was built on Snedecor Avenue and Railroad Street in 1956. In 1896 they bought a hook and ladder truck so heavy that there were not enough members to pull it to the fire. The Methodist Church was completed in 1874 on the south side of Middle Road. It is the only church in Bayport. The first pastor was a Mr. Kristeller, a converted Jew. A large addition to the Church building was added on the west side in 1963. One of the oldest taverns in Suffolk County was the Manhattan House on the north side of Middle Road just west of the old Fire House. It was built in 1847. It burned in 1963. The early residents of Bayport made their living from the bay. There were oyster houses on the bay west of Seaman Avenue. The oyster business was badly damaged by the hurricane of 1938. The last of the oyster houses owned by the Rogers family was closed in 1940. In 1870 there was a fish factory on the bay, near Gillette shipyard on the bay operated by Captain Smith Rogers. Brown's River was named for the Edmund Brown family (1851-1930) who had an oyster and clam business on the bay at Brown's River. Later many "worked under glass" in the large commercial greenhouses erected in the Bayport area, most of them built in the period between 1890 and 1930. The most important were roses, carnations, and chrysanthemums. They had an annual export value of about $1,500,000 each year. Many of the greenhouses are still in operation. Oakwood Avenue, east along Railroad Street, to Blue Point Avenue, thence up to Montauk Highway to Patchogue. As mentioned before, there were no sales in Bayport made by the Nicoll Estate until after the Revolution. 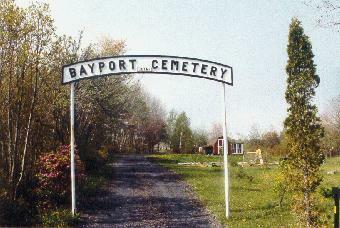 Between 1790 and 1850 most of Bayport was sold and many of those original families survive in the area today. Names still familiar today are Gillette, Smith, Overton, Hawkins, Homan, Brown, Snedecor, Terry, Howell, McConnell, Seaman, Steins, Lane, Pell, and Hicks. So far as we know the oldest home in the area standing today was built by Zebulon Gillette in 1796. Another home still standing also built by Zebulon Gillette is just across the Brookhaven line east of Namkee Creek, built in 1812, and later sold by Mr. Gillette to Joseph Avery. About 1890 many of the old farms gave way to handsome summer estates between Middle Road and the bay. Regis Post, Governor of Puerto Rico on Ocean Avenue; Julius Liebman, the brewer, on Suydam Lane; Robert Roosevelt, minister to the Netherlands, appointed in 1880 by President Cleveland, on Brown's River, on land purchased from the Lane family in 1873; John Delaney, New York Transit Commissioner, on Fairview Avenue; William H. Todd, ship builder, on Middle Road; John R. Suydam, who came to Bayport in 1855, had an estate called "Edgewater" on the bay, and was a minor founder of St. Barnabus Mission in 1866 (now St. Ann's Church); John McConnell came to Bayport in 1870 and purchased all the 63 acres from Middle Road to the Long Island Railroad along what is now McConnell Avenue, which is named after him. His daughter, Jennie McConnell married Faank Melville, a shoe manufacturer. They built a home in 1873 at #395 Middle Road, and were the parents of Ward Melville of Stony Brook fame. A girl scout camp called Camp Edey has been located for many years on the east side of San Souci Lakes, on Lakeview Avenue. Many years ago these lakes were known as the "cranberry marshes" because cranberries for the market were grown there. In the winter ice was cut there to be stored for the summer. North of Montauk Highway the Nicoll estate had sold the land in 50 acre tracts. Among the purchasers were Whitman Overton, Wallace Overton, Edward S. Gillette, Warren Hawkins and Daniel Howell. Probably no other community in Suffolk County has as many old homes dating back well over a hundred years as the village of Bayport. Many of the homes along Middle Road date back over 150 years. The Clark Smith farmhouse on the northeast corner of Fairview Avenue was built around 1800. Lawrence Edwards came from the island of Barbados and bought a farmhouse where the Parmentier nursery is located today. In 1834 he built the three homes on the north side of Middle Road in later years occupied by Miles, Chidester and Alvarez. Carmen Seaman built the farmhouse on the southeast corner of Seaman Avenue about 1810. Seaman Avenue is named after him.